I have been the Prject Manager at McDaniel Contractor Services for the past 30 years where it was my privilege to work with Marcus Moore with Moore Restoration as a subcontractor. 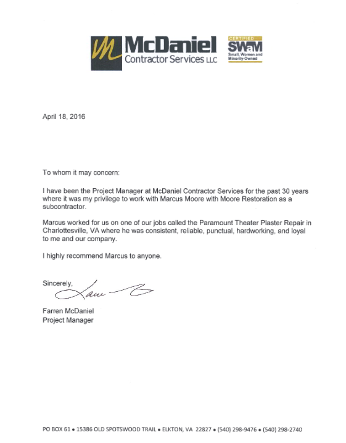 Marcus worked for us on one of our jobs called the Paramount Theater Plaster Repair in Charlottessville, VA where he was consistent, reliable, punctual, hardworking, and loyal to me and our company. I highly recommend Marcus to anyone. 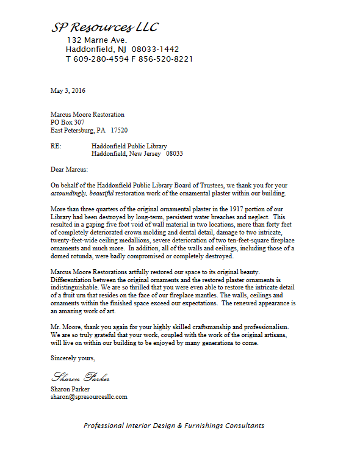 On behalf of the Haddonfield Public Library Board of Trustees, we thank you for your astoundingly, beautiful restoration work of the ornamental plaster within our building. More than three quarters of the original ornamental plaster in the 1917 portion of our Library had been destroyed by long-term, persistent water breaches and neglect. This resulted in a gaping five footvoid of wall material in two locations, more than forty feet of completely deteriorated crown molding and dental detail, damage to two intricate, twenty-feet-wide ceiling medallions, severe deterioration of two ten-feet-square fireplace ornaments and much more. In addition, all of the walls and ceilings, including those of a domed rotunda, were badly compromised or completely destroyed. Marcus Moore Restorations artfully restored our space to its original beauty. Differentiation between the original ornaments and the restoredplaster ornaments is indistinguishable. We are so thrilled that you were even able to restore the intricate detail of a fruit urn that resides on the face of our fireplace mantles. The walls, ceilings and ornaments within the finished space exceed our expectations. The renewed appearance is an amazing work of art. Mr. Moore, thank you again for your highly skilled craftsmanship and professionalism. We are so truly grateful thatyour work, coupled with the work of the original artisans, will live on within our building to be enjoyed by many generations to come.